CHEYENNE, Wyo.—“Take my yoke upon you and learn from me, for I am meek and humble of heart; and you will find rest for yourselves. For my yoke is easy and my burden light” (Mt 11:29-30). That yoke was placed upon Bishop Paul D. Etienne in a deeply symbolic ritual a few minutes after he heard those comforting words proclaimed during the Dec. 9 liturgy in which he was ordained and installed as the eighth bishop in the 122-year history of the Diocese of Cheyenne. The 1,600 people who filled the Cheyenne Civic Center for the liturgy were made up of many Catholics from Wyoming and Indiana, several bishops, including Cardinal Roger M. Mahoney of Los Angeles, scores of priests, deacons and religious, and representatives of other Wyoming faith communities and local civic officials. It was held there to accommodate the crowd and because St. Mary’s Cathedral in Cheyenne is in the process of being restored. Archbishop Chaput, the principal consecrator of Bishop Etienne, invited those present to consider the deep bond between episcopal leadership and the family. “A good bishop is a father to his people, a brother to his priests and a husband to his local Church,” Archbishop Chaput said. “It is a vocation of love, which demands courage, wisdom [and] self-sacrifice. Bishop Etienne’s parents, five siblings, and several nieces and nephews attended the liturgy. Archbishop Pietro Sambi, apostolic nuncio to the United States and the representative of Pope Benedict XVI at the ordination liturgy, then spoke, quoting from a recent homily that the pope gave during an episcopal ordination in Rome in which he encouraged new bishops to continue Christ’s ministry of healing. “Your Excellency, Bishop-elect Etienne, we are truly confident that, as you faithfully carry out your episcopal ministry, you will bring the healing rays of the Good News, which is Jesus Christ, to the clergy and to the faithful entrusted to your pastoral care, and that you will also radiate his loving face to the community at large,” Archbishop Sambi said. After his remarks, the nuncio read the apostolic letter in which Pope Benedict appointed Bishop Etienne as the new shepherd of the Church in Wyoming. Bishop Etienne is the 10th priest of the Archdiocese of Indianapolis to be ordained a bishop in its 175-year history. Bishop Gerald A. Gettelfinger of Evansville, who ordained Bishop Etienne to the priesthood in 1992, was the most recent in 1989. Ordinarily, the principal consecrator at an episcopal ordination gives the homily at such a liturgy. In this instance, Bishop Etienne asked that Bishop Lynch give it because of their longstanding close friendship. They worked together more than 20 years ago at the U.S. bishops’ conference when Bishop Etienne, then a layman, assisted then-Father Lynch in organizing Pope John Paul II’s 1987 coast-to-coast apostolic journey to the United States and Canada. Bishop Lynch was also the homilist at then-Father Etienne’s Mass of Thanksgiving after he was ordained a priest in 1992. Bishop Lynch had some words of advice for Bishop Etienne. “Be humble,” Bishop Lynch said. “Be what you have been, which led so many to write in favor of your possible appointment as a bishop. Be the same pastor and brother that has led so many of your brother priests from the Archdiocese of Indianapolis to fly the long distance to hand you over to another Church. Be the pastor whom people in all the parishes which you have served, who said farewell to you in tears these last few weeks, will long remember. Following the homily, Bishop Etienne laid prostrate while those assembled prayed the litany of the saints for him. The bishops present then ritually laid hands on Bishop Etienne’s head and the prayer of consecration was prayed. 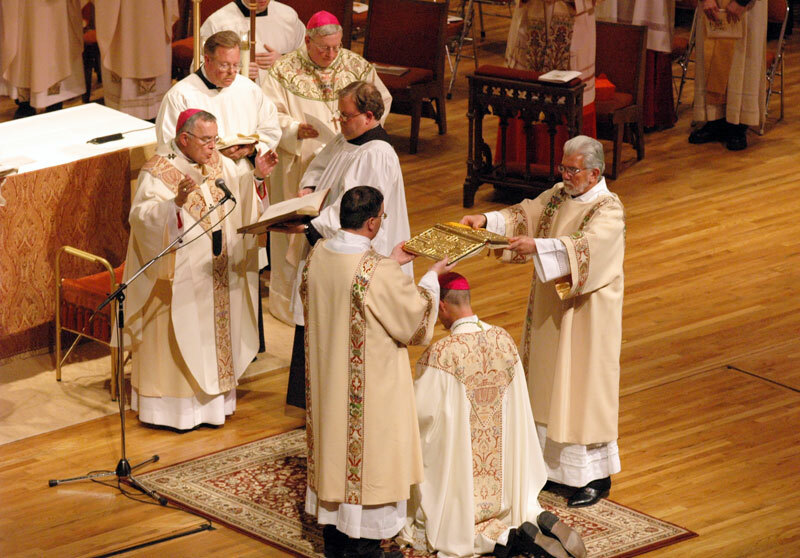 Archbishop Chaput anointed his head with chrism and then presented Bishop Etienne with the symbols of the episcopate: a book of the Gospels, an episcopal ring, a miter and a crosier. Bishop Etienne was then seated in the Cheyenne Diocese’s cathedra, the bishop’s chair that is ordinarily in its cathedral, for the first time. Bishop Etienne’s ring had previously belonged to Pope Paul VI. 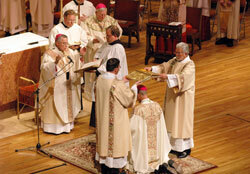 He was given his crosier, which was made by a monk of Saint Meinrad Archabbey in St. Meinrad, by Archbishop Buechlein. After Communion, all present applauded while Bishop Etienne, accompanied by Archbishops Buechlein, Chaput and Sambi and Bishop Ricken, walked up and down the aisles of the Cheyenne Civic Center to give his blessing. In his remarks, Bishop Etienne thanked the many people who came to Cheyenne for his ordination and installation. He then spoke to the faithful in Wyoming, who he has been charged to lead. “I embrace you with a pastor’s heart, freshly filled with the grace and love of Jesus Christ,” Bishop Etienne said. Reflecting on Jesus’ invitation to his first two disciples to “come and see” where he lived (Jn 1:35-39), Bishop Etienne invited his faithful to join him on a journey to discover anew Christ’s dwelling place. “My desire as your bishop will also be to spend time with you, to discover Christ in your midst, as I seek to be the presence of Christ for you. “This is God’s desire for us, and together we will seek this divine dwelling place, for we are his people, the people redeemed by Christ for such communion,” Bishop Etienne said. “Together, we will follow Jesus, all the days of our life, so as to live with Him for all eternity in the household of God, which is the Kingdom of Heaven.